If the social media reaction of many of the fans who thoroughly enjoyed Saturday’s Kyalami’s Motorsport Festival is anything to go by, it was a brilliant day all round – never mind that the impressive crowd assembled along the grassy banks clearly enjoyed a fine show on a perfect Indian Summer’s afternoon. Their enjoyment was guaranteed by some brilliant action on track too – not least of all from the Sasol GTC brigade, as South Africa’s fledgling premier tin-top race series shrugged off some recent criticism to deliver a cracking pair of races. Gennaro Bonafede (Sasol BMW) won a lovely opening race from Simon Moss (Engen Audi), Johan Fourie (EPS Couriers BMW) and Mathew Hodges (VW Jetta) after early leader Michael Stephen (Engen Audi) slowed with mechanical bothers. Race two delivered spectacular action off a reversed grid, with several leaders and thrilling dices. Michael Van Rooyen (RSC BMW) initially led the way but a fraught dice evolved that first saw Johan Fourie’s BMW ending up in the Esses wall before Robert Wolk lost his BMW in the kink to trigger a dusty incident and Simon Moss spinning in avoidance. That left Michael Stephen to win from Hodges, the recovered Moss, Bonafede and van Rooyen after Wolk stopped. The production GTC2 class delivered great racing too. Keagan Masters beat his works VW Golf GTI teammate Mandla Mdkane and Trevor Bland (VW Golf GTI) in race 1, but Mdakane took the GTC2 honours from Charl Smallberger (VW Golf GTI) and Masters in a most entertaining second race. The G&H Transport Extreme Supercars was another Kyalami Motorsport Festival drawcard, but it was all about Kyalami owner Toby Venter, who not only blasted his works Porsche 911 GTR to a popular double victory, but he also lowered his own class lap record by almost three seconds in the process. Toby beat Cape visitor Johan Engelbrecht (JogaJoga Porsche), Charl Arangies (Stradale Ferrari 430), Franco Scribante (Ferrari 430) and Dawie Olivier (G&H BMW M3) in the first race and from Engelbrecht, Scribante, Arangies and Marcel Angel (Autohaus Angel Ferrari 458) in race 2. A family wedding saw Pepper Racing’s Senior Team duo missing Kyalami, but team boss Iain played a masterful wildcard to enter Lee Thompson in absent groom Shaun La Réserveé’s Alpine Polo and Dewald Brummer in maid of honour Tasmin Pepper’s Campos Polo. Thompson promptly went on to annihilate the regular field to take a stunning pole position before going on to beat Devin Robertson (Payen Polo) and Clinton Bezuidenhout (Glyco Polo) in race 1 and Brummer and Juan Gerber (Glasfit) in race 2. Julian van der Watt (Investchem Mygale) took both Investchem Formula 1600 single seater races to continue his iron grip on the new wings and slicks class over future stars Stuart White (Fantastic Mygale), who was second on both occasions, with Alex Gillespie and Cameron O’Connor sharing the third places. Pole man Ben Morgenrood’s Ford Mustang dropped out on the warm-up lap for the first V8 Supercar race to leave Mackie Adlem (Mapogo Jaguar) to win from 17-year old lass Lonika Maartens (Hoosier Chev Lumina) and Franco di Matteo (Delco Batteries Jaguar). Adlem did the double in race two to beat another 17-year old, Ben’s son Benjamin Morgenrood (Ford Mustang) and Terry Wilford (Fuchs Jaguar), while Fabio Tafani (APF Mustang) took both visiting Cape V8 Masters wins from Carl Nel and Charles Arton each time. Jason Campos (Shelby V8) took an easy couple of victories in the National Sports Car Championship races on his way to setting a new overall Kyalami lap record of 1 minute 45,309 seconds. Campos was followed by Shelby CanAm duo Brian Algar and Michael Jensen each time. The SKF Legends Classics delivered some great Kyalami memories and close racing as Jonathan du Toit (Chevron B9) narrowly beat Keegan Campos (Porsche RSR) with Ben Morgenrood third in his Ford Mustang. Morgenrood and Campos touched at the end of the main straight, sending the Porsche into the sand trap in race 2 to leave du Toit to a second second victory of the day from Morgenrood and Mark du Toit (Lola T70). But the biggest winner on the day was the new Kyalami Grand Prix Circuit, which not only delivered some great racing, but it also went down in a classic atmosphere as fans lapped up the action alongside their braais and friends at an iconic venue – just like it once always was. 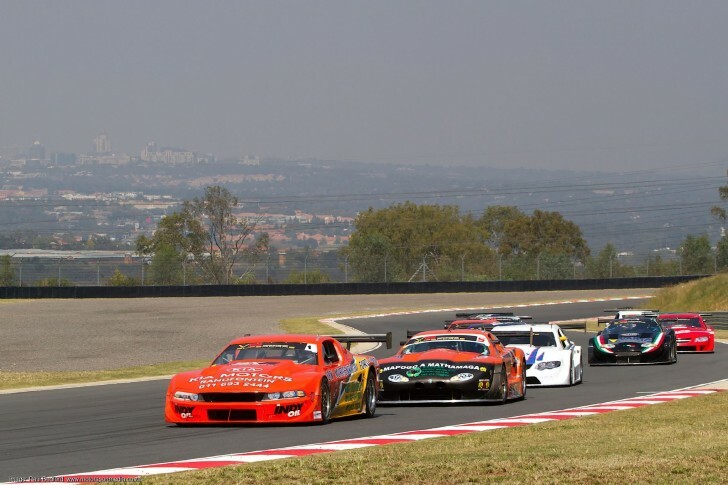 National racing returns to Kyalami in November.